In Adult Swim’s popular cartoon series Rick and Morty, irreverent mad scientist Rick Sanchez embarked on an interdimensional adventure with the sole purpose of getting a packet of McDonald’s Szechuan sauce. Here in the real world, others are willing to pay thousands of dollars in cold, hard cash for the tasty dip. After 20 years of experiencing neglect in the back seat of a car, a packet of McDonald’s Szechuan Chicken McNugget dipping sauce recently sold for nearly $15,000 on eBay. The condiment, which was a promotional product for the 1998 Disney film Mulan, has returned from ’90s obscurity after receiving a shout-out on Rick and Morty. 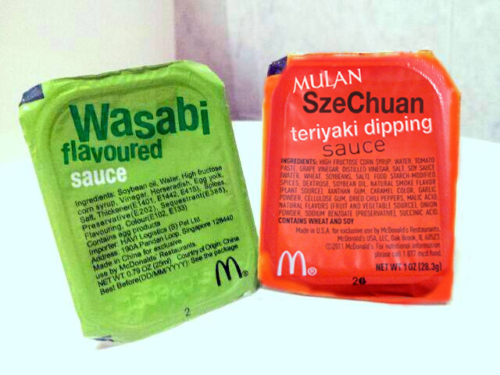 In the season three premiere that aired earlier this month, Rick reveals that his entire motivation behind his wacky and convoluted mission was based on his craving for the “Mulan McNugget sauce.” He adds that getting his hands on the sauce is his personal “series arc” — even if it takes nine seasons, Morty. Several more auctions have popped up since, and there are also several petitions circulating online to bring back the sauce; at least one has garnered almost 40,000 signatures. Plus, the timing is perfect: Mulan will be remade into a live-action film next year, and it’s pretty clear that bringing back this promotional offer would be well-received. Watch a clip of Rick praising the sauce’s virtues and his ridiculous plot below.